UKIP may be preening itself on its polling results, demonstrated today in the Opinium/Observer poll. It is up one point from a fortnight ago, with 17 percent, as against Labour on 38 percent (unchanged), the Conservatives unchanged at 28 percent and the Lib-Dems dropping one point to eight percent. However, the sudden rush of popularity (insofar as it is real) may be less to do with the approval ratings of Mr Farage (who is mercifully unknown to most of his putative voters), as to a growing, and Europe-wide disillusionment with established political parties. Even in very conventional and staid German politics, the winds of change seem to be blasting through the system. No sooner did Die Welt report its own opinion poll telling us that Merkel's CDU/CSU grouping was well ahead in the polls, with "no sign of a mood for change", then up pops a poll on the AFD which has a potential 24 percent of the vote at the general election. Unlike UKIP, though, the new party fares better with the young than the elderly, and with supporters of the Left. This is very much in keeping with other eurosceptic movements on the continent and in the Scandinavian bloc, where Denmark and Norwegian sceptics have a decidedly Leftwards tinge. 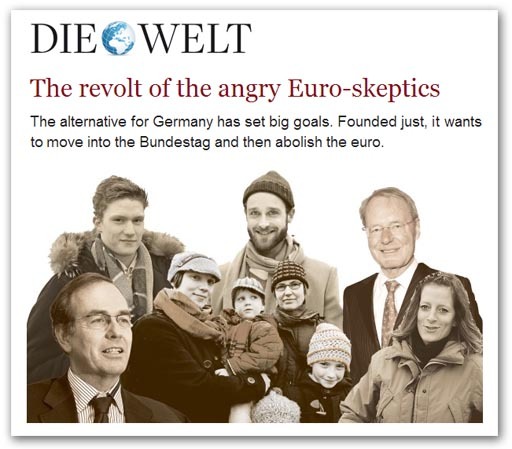 The German movement, though, is very much looking to working within the existing political system. Founding member Bernd Lucke says his party firmly supports the Basic Law (constitution), declaring: "We are not ideological". In Italy and Holland, in Grillo and Geert Wilders, we also see anti-EU/internationalist sentiment coalesce around parliamentary parties, with the main effort directed to winning seats in the respective parliaments. The same applies to Austria, where the minority Freedom Party has dominated radical politics. Possibly more interesting, though, are the "wildcat" extra-parliamentary movements in France and Spain. 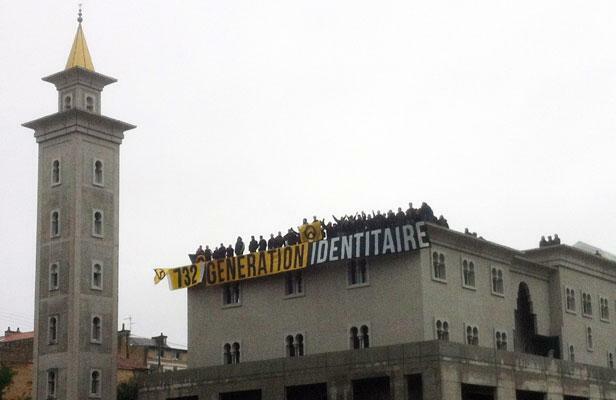 In France, we are seeing the emergence of the "Génération Identitaire", young, angry and on the rise – and now spreading to Germany, where there are 39 regional associations. At the end of March, the French grouping was out in the streets of Paris as part of a 300,000-strong protest demonstrating against gay marriage. Strongly opposed to Islam and anti-immigration, some members have sought active confrontation with the police. France's Interior Minister Manuel Valls blamed them for the riots which ensued during the demonstration, and video footage shows activists with "GI" flags in confrontation mode with the police and emergency services. With no central direction, they rely on the anonymity of the Internet to spread their "nationalist-right" message, where they speak of the "European Spring" in the manner of the Arab Spring. This is a message of violent uprising against government, their symbol the Greek Lambda, with roots stretching back to 1974. The German branch openly expresses its objective as "the preservation of our ethno-cultural identity, which is now threatened by the demographic collapse, mass immigration and Islamisation". The aim of the movement, it says, is "a cultural and spiritual revolution which values tradition, home, family, culture, nation, state, order, and beauty". For the French, one of their activities has been to occupy on 20 October 2012 a mosque in Poitiers, protesting against the "Islamisation" of French society. For more than six hours, 60 protesters held out on the roof of the building, displayed banners and chanting (picture above). And the choice of Poitiers was no coincidence: In 732, Charles Martel defeated a Muslim invading army. Through their parent organisation, the Bloc Identitaire, alliances are claimed with movements of a similar nature in Portugal, Catalonia, Holland, Belgium (Vlaams Belang), and Italy (Lega Nord). There is no association claimed with Greece, though, where the racist Golden Dawn is mounting both parliamentary and extra-parliamentary opposition. As for Spain, there were have seen the growing protests under the label of the "Indignados" (often with strong trade union support), but – in response to the power and weaponry of the riot police, we have seen a change in tactics with the emergence of the flash mob, targeting politicians and officials in their own homes. Calling themselves the escraches, they are copying tactics developed in Argentina, as a means of countering the violence of the junta. As a dispersal tactic, it has similarities to the August riots of 2011, where the police were unable to deal with multiple outbreaks of violence, spread over a wide area. Quite whether these various episodes of protest amount to anything lasting, or have the capacity to secure long-term change, is open to question. Unlike our own Harrogate Agenda, which wants fundamental change, most of the parliamentary protests seem mainly to oppose specific policies, without seeking revolution. The revolutionary groups, on the other hand, such as the Génération Identitaire, seem to be seeking revolution, without any clear ideology. The one thing that unites them all, though, is the dislike (to put it at its most neutral) of establishment politicians. That form of unity, the European Union has achieved, but what happens next is not entirely clear.